For many of us living on the southern (Gulf) coast of the USA, it has become common to see numerous dead fishes floating in the bays and scattered across our beaches. Why is this happening? You may have heard on the news that there is a large harmful algal bloom (HAB) that began off the western coast of Florida and has slowly spread throughout the Gulf over the past few months. While the HABs occur somewhat regularly in Florida, it is quite rare for them to extend as far north as they have this year. The last major HAB of this particular dinoflagellate species (Karenia brevis) occurred ten years ago. 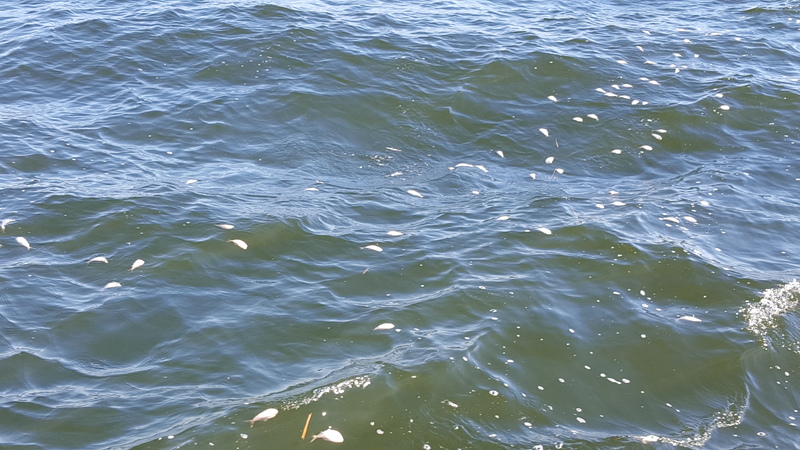 The Mississippi Department of Marine Resources has been monitoring the bloom recently, and they have seen some of the negative effects of the ecosystem. The lumpy greenish-transparent blob (near the center of the photo) is Karenia brevis. 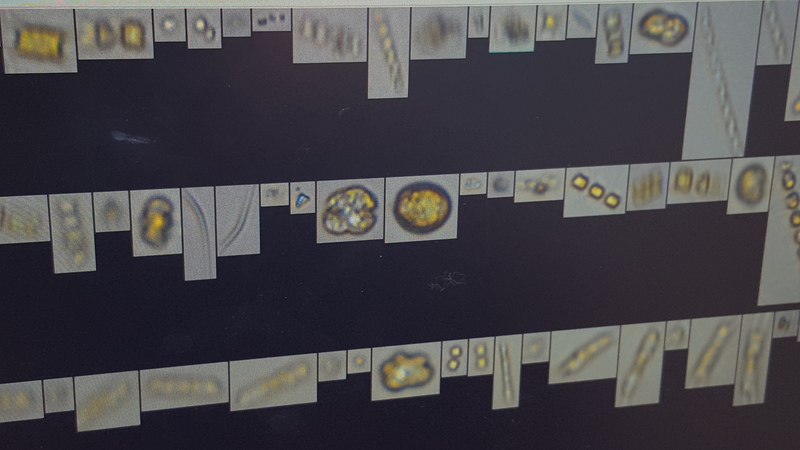 These images were captured with the FlowCam, which is an instrument that images algal sized particles in a water sample. Thousands of dead Gulf Menhaden accumulate at a front off the coast of Mississippi. Fronts concentrate floating objects (dead fish and other debris) by providing a convergent flow (photo by Adam Greer taken on Dec. 15, 2015). So how do these tiny plankton kill the fish that we see washing up onshore? After all, the individual phytoplankton within the HAB are only about 20 microns in size (that is 0.02 mm). Karenia brevis (a.k.a. “the red tide” derived from its brownish-red color at high concentrations) naturally produces a compound known as brevetoxin – a potent neurotoxin that inhibits sodium channels required for many neurological processes. Some of the most abundant fish species in the Gulf of Mexico are filter feeders such as Gulf Menhaden. These are commercially important fish that feed by opening their mouths and swimming to capture as much phytoplankton as they can. Karenia brevis is often present off the Florida coast, but in low abundances. Under these circumstances, Karenia brevis does not harm the fish that consume it. Only when the concentrations reach extreme levels do the fish experience the negative effects of the brevetoxin. Filter feeders like the menhaden are most directly impacted by the phytoplankton-produced toxin; however, the organisms that consume these fish are also susceptible to the harmful neurological effects. Large black drum have also been washing up onshore, presumably killed by eating too many menhaden and other fish species that had built up high levels of toxin in their tissues. Even dolphins and birds can become very sick from eating these suddenly toxic fish. 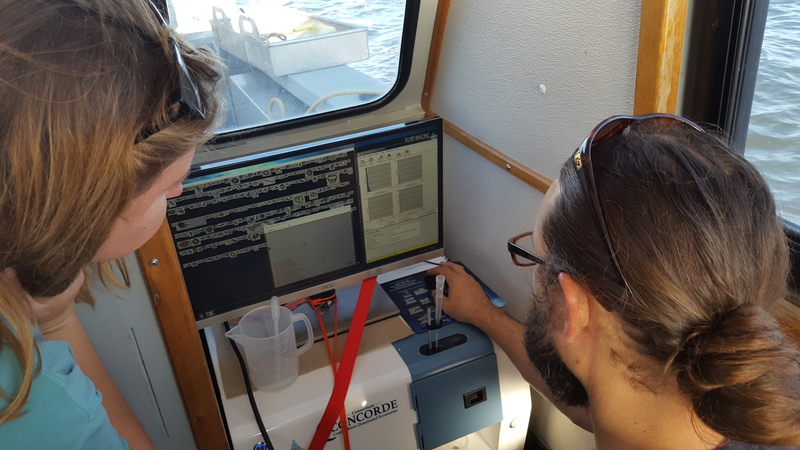 University of Southern Mississippi scientist Adam Boyette runs the FlowCam to characterize the phytoplankton community and monitor the HAB. Why is this bloom so severe this year? While there are probably a variety of factors at play, most agree that an unusually strong El Nino is likely the primary culprit. Along the Gulf coast recently, it has been unseasonably hot and dry. The winds have also been calm. This provides ideal conditions for Karenia brevis to proliferate and form dense aggregations. With cooling temperatures, the growth rates of these phytoplankton should decrease. The increasing amounts of rain and wind recently should cause these HAB patches to break up, diluting the extreme concentrations, which will hopefully mitigate the harmful effects on Gulf of Mexico ecosystem. This entry was posted in Oceanography, Plankton, Science by agreer35. Bookmark the permalink.